Ahead of the Aug. 7 primary election, 7 Action News is sitting down with candidates for governor and U.S. Senate to learn more about them and their ideas. 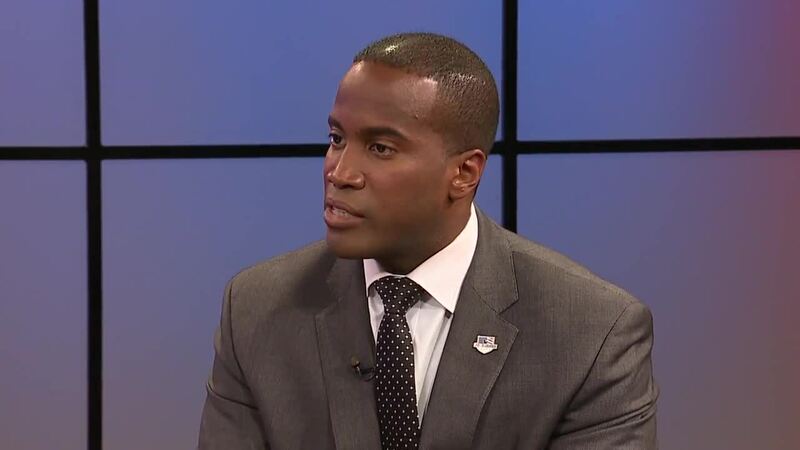 We spoke with John James, a Republican candidate for US Senate. Q: What doesn't the average person know about your interests and hobbies, who you are outside politics? A: I really want to be known for being a good strong man of faith. A good husband and father in that order. But, what I really want to work on is a boarding school for foster kids. I really have a passion for children. Their education. To wrap my arms around the kids who are trapped in foster care, the orphans. Come up with a Country Day/Cranbrook type education system where teachers are compensated well. Students are invested in, and I would really like to start a school with my wife. Q: Mass shootings have made a major impact on our country in recent years. Where do you think we should make changes and what changes would you push for? School security? Mental health? Gun laws? A: Increase funding for mental health and to research and actually application implementation. I believe that the role of the federal government to infringe upon the 2nd amendment is very very clearly laid out. The government, the federal government shall not infringe upon that. However, there are plenty of things that we can do. If you take a look at the characteristics of how this has spread, it looks like a virus. It looks like a national health concern. I think we should address it as such. I believe that working with the CDC, working with other experts around the country, and bringing both sides together to find a long-term solution to this issue, I believe that’s the solution we need, not more political pickering. Q: Many families in Michigan have been impacted by illegal immigration. Where do you stand on the issue of illegal immigration and the crackdown by the Trump administration? A: We are a nation of immigrants, but we are also a nation of laws. I and our president both are proponents of legal immigration. Illegal immigration is a direct affront to those who’ve immigrated here illegally and to the taxpayer. I believe that we need to have common sense, compassionate and constitutionally consistent immigration reform. I believe that we need to secure our borders. We need to secure our entry points. We need to defund sanctuary cities. And we need to protect ICE and our other government agencies that keep us safe here at home. Q: How will you work to ensure Michigan’s economy keeps growing, and jobs keep coming to our state? A: There is no reason that we shouldn't be leading in automotive mobility, agriculture and also aerospace and defense. When we the government get out of businesses way and allows them to innovate and not have preemptive regulations that stifle innovation, you tear down barriers, and then capital investment will come. I also believe that if you have comprehensive legal immigration reform that allow farmers and factories to be able to get those guest visas that our president advocated for the last time he was here in Washington Township, I believe that you have farmers in a better position to contend with global pressures and also be able to make money on their farms. Q: What can we do to help people in Michigan get the health care they need and can afford? A: The first question we should all be asking is: ‘Whose interest are being served?’ That answer number 1 should always be the patient. The patient’s interest should be being served. Not the government, not the politicians not the insurance companies but the patient. We need to make sure that we have a patient centered, preventative in nature market driven approach where patients are able to control their own destinies and have the resources to do so, and we tear down the barriers and regulations that happen. That’s going to require tort reform. That’s going to require lowering pharmaceutical cost, and it’s going to require education in order to make sure that we look at prevention and changing some behaviors. Q: What will be your biggest challenge in D.C. if elected? A: I believe that the first thing, the hardest thing I’m going to do is work with people who are advocating for our state, pulling people together, increasing civility, execution, and making sure we abide by the constitution as it’s written but also bringing results back home, economic opportunity back home and national security for the United States of America. My biggest challenge if elected would be: you brought up experience. Again, I’m a combat veteran who has had to lead in the toughest situations. Anybody can manage. Managing is taking a bunch of people who believe the same thing to do something they want to do. I have leadership experience. That’s taking people from different races, colors, creeds ethnicities and getting them to do something they don't want to do like flying toward bullets. Q: An opponent of yours says you donated to a leftist councilwoman in Detroit who supported sanctuary cities? A: I attended a meet and greet because I believe it is my responsibility to know the people who are representing me and I’ve grown jobs in southwest Detroit, and she was the councilwoman who represented that area. But, I do not support a leftist agenda, and we must again, defund sanctuary cities. Secure our borders and support ICE and protect them from the liberal leftist progressive agenda.